Welcome to Bratislava, also known as the beauty on the Danube. Our city has great potential for you to chill out in a relaxed, laid-back town. As opposed to cities like Vienna, Budapest or Prague, here you will find it easy to circumnavigate, find narrow allies with picturesque scenes, small tea and coffee houses and much more. The Wild Elephants welcomes you to the only hostel in Bratislava run and built by backpackers for backpackers. As some would say, 'mi casa es su casa', you are welcome to chillax in the heart of the historical city center. Located literally 10 steps from the Main Square of Bratislava in a quiet alley next to a small fountain underneath big trees. Our hostel is a experience unlike many others. We ARE NOT a cheap hotel, so if you are looking for one, write us an email and we will be grateful to send you a few tips. Here you find the complete opposite, especially the homelike atmosphere, where staff and guests form one bunch. The Wild Elephants are not about LCD or other amenities such as Xbox or Wii. It is about meeting travelers, socializing, cooking together, getting locals and visitors mixed up in bars and having the best beds, best staff, best location and best internet connection ;). The hostel gives you the opportunity to explore the city just by walking out from the main entrance, or using one of the bikes we offer free of charge. We have free fast WIFI so you can continue doing the online social jazz, when not joining one of our activities. The best of all, our staff will do the best we can to make you feel at home, by offering different tours, movie nights, cooking events and all the enjoyable elephant activities. We mix hip eco furniture with some rustic parts so when you crash on the couch you will feel like an elephant at home. We are always improving the place and always welcome creative people with great ideas, so open-minded people are more then welcome! 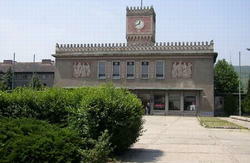 MAIN Train Station (Hlavna Stanica, Bratislava Hl. St.) - Bus 93, get off at the second stop (Hodzovo nam. ), from here continue walking straight (do not turn towards the castle on the right side!). When you pass the tram tracks you walk 10 more steps and turn right into the historical center ( again, you should NOT be able to see the castle :P). You are now walking down Michalska street, underneath Michal's Gate. The second street to the left is Biela Street, and at the end of this street next to the square you will find the hostel on the left side. It's the green building with the spider and the chalkboard sign on the right. Inside, take the second door to the left and walk up the stairs to the second floor. This should not take more then 10-15 minutes, in case you are not at the hostel by this time, just call us. PETRZALKA Train Station (Some trains from Vienna) - Bus 80 (direction Kollarovo Nam. ), get off at the 5th stop Zochova. Turn left from the bus, walk in the direction the bus IS going for 20m and turn right, you are walking between a big ugly building on your left and a old monastery on your right. At the end of the street you will see tram tracks, cross them and continue straight for 1 more minute. Turn right into the historical center . You are now walking down Michalska street, underneath Michal's Gate. The second street to the left is Biela Street, and at the end of this street next to the square you will find the hostel on the left side. It's the green building with the spider and the chalkboard sign on the right. Inside, take the second door to the left and walk up the stairs to the second floor. This should not take more then 10-15 minutes, in case you are not at the hostel by this time, just call us. MAIN Bus Station (AS Mlynske Nivy) - Bus 210, leaving from directly in front of the bus terminal all the way to the Main Train Station. From here follow the directions from the Main Train Station. NOVY MOST Bus Station (Most of the buses from Vienna) - Walk into the old town (your back towards the castle and the river to your right), continue for 5-10 minutes. When you come to the McDonalds (c), turn left and walk for 5 more minutes. At the big square (Main Square) with the fountain, walk to the trees on the right, we are just behind them. It's the green building with the spider. Go inside and take the stairs through the second door to the left up to the second floor. !In case you decide to take a TAXI, you should agree on the price before you enter and it should not be more than 10EUR from anywhere in town, except from the airport, which should not be more than 15EUR. 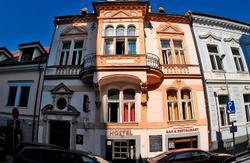 Newly renovated hostel KIWI in Bratislava provides acommodation in comfortable 2 to 8 bed rooms with air conditioning. Social facilities and kitchen are available on each floor.